The Rohde & Schwarz two-quadrant power supplies NGL200 series can operate as both a source and a sink. Power supplies can absorb power in a controlled way, allowing them to simulate the specific characteristics of a battery. The R&S NGL201 and NGL202 models with one and two channels respectively provide up to 60 W of output power per channel. The output channels are floating, galvanically isolated and protected against overloads and short circuits. The single-channel NGL201 model is available from Rohde & Schwarz and its distributors from 1900€ and the two-channel NGL202 model from 2900€. 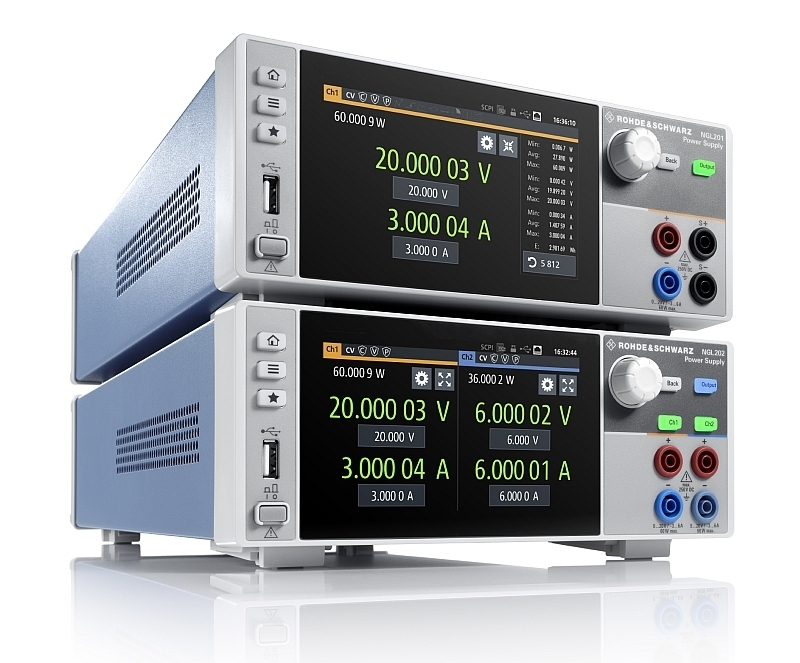 The R&S NGL200 power supplies are equipped with a capacitive touch screen. The ventilation is temperature-controlled to ensure quiet operation. Safety functions protect the device under test and the power supply in the event of a fault. Their linear regulation ensures the stability of the output voltages and currents delivered. Power supplies supplying, for example, IoT equipment and other battery-powered devices or semiconductor testing must be able to withstand load variations from a few µA to a few amperes without voltage drop or overvoltage. 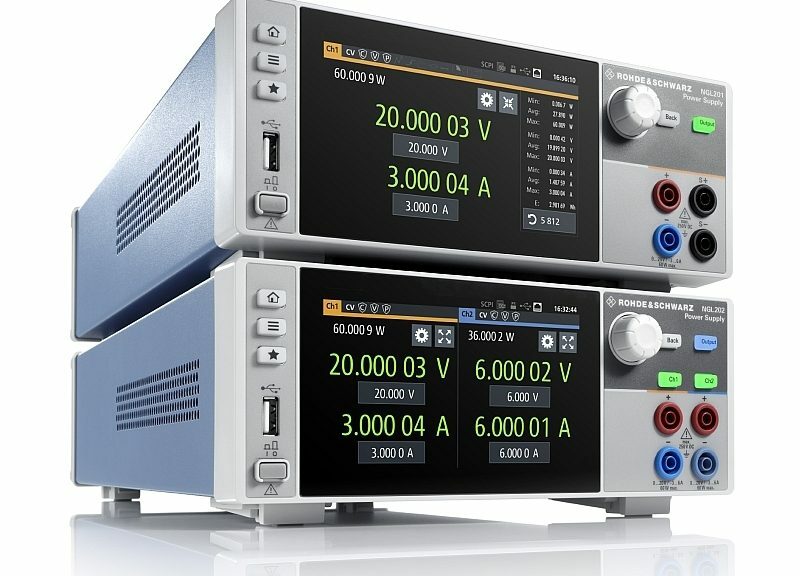 Thanks to their charge recovery time of less than 30 microseconds, these power supplies are adapted according to Rohde & Schwarz to this type of application. The two-quadrant linear design of their output stages allows them to operate in source and sink, with automatic switching from source mode to sink mode. With a resolution of up to 6 digits ½ for voltage, current and power measurements, R&S NGL200 power supplies can characterize devices with low standby power consumption and high current requirements at full load. The entire required measuring range is covered without changing the range. According to Rohde & Schwarz, this means that in many situations, an additional digital multimeter is not required. These power supplies are equipped with connectors for sense lines and USB and LAN interfaces for remote control. Thanks to the NGL-K102 option, they can be controlled wirelessly by Wi-Fi (WLAN). 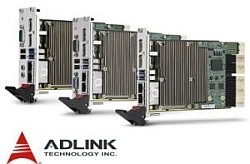 The NGL-K103 option provides digital inputs and outputs and the NGL-B105 option provides a GPIB interface (IEEE-488).